See the VDACS press release or flier June Consultant Meeting Flier for additional details. 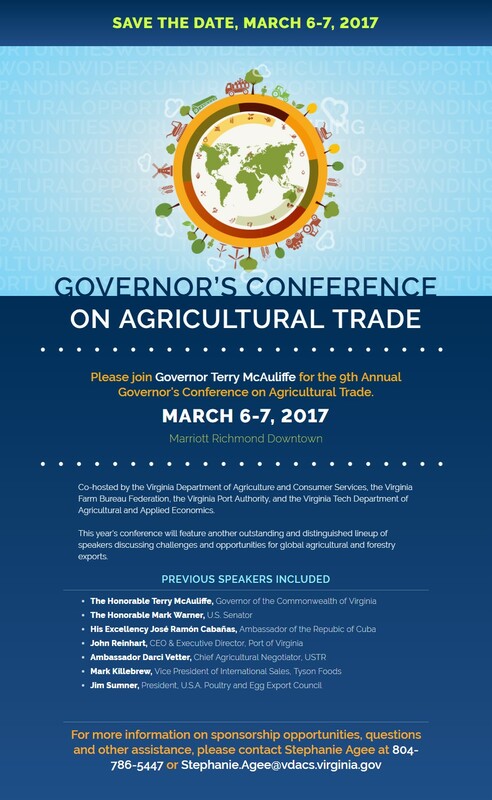 Note: To register for one-on-one meetings or request more information, interested Virginia agriculture and forestry businesses may contact Caitlin Clark in VDACS’ Office of International Marketing at 540.461.1246.
is shaping up with invitation extended to many outstanding and distinguished speakers. 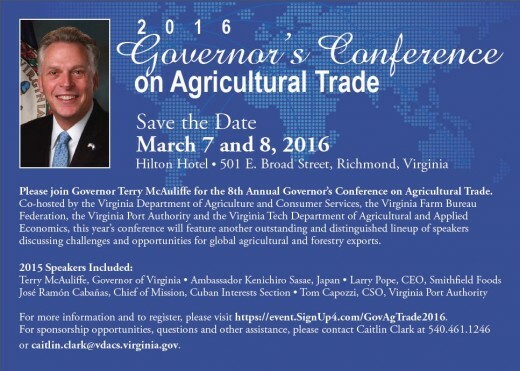 2014 Speakers Included: Terry McAuliffe, Governor of VA Ambassador Kenichiro Sasae, Japan Darci Vetter, USTR Chief Agricultural Negotiator Tom Capozzi, CCO, Virginia Port Authority Todd Haymore, Virginia Secretary of Agriculture and Forestry Larry Pope, CEO, Smithfield Foods. 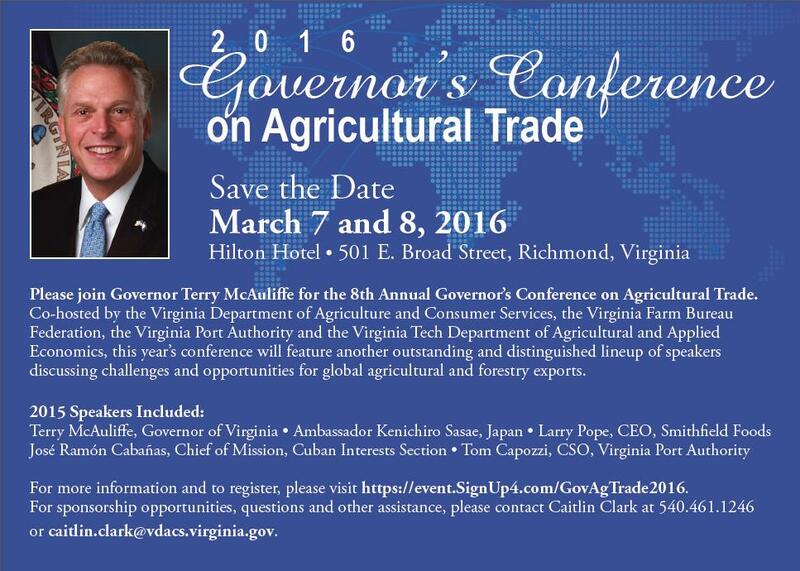 Registration opens in December at http://events.SignUp4.com/GovAgTrade2015. Website will include program updates, agenda & registration information. 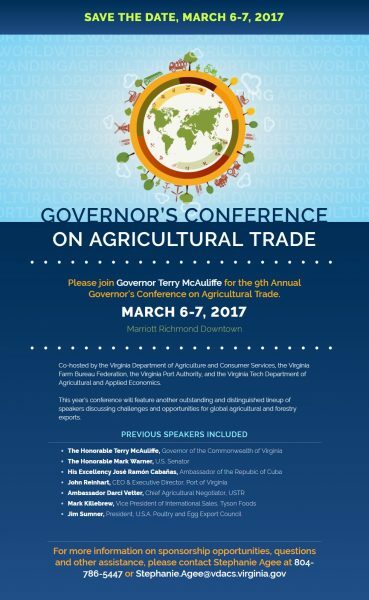 The following are presentations that were presented at the Virginia Governor’s Conference on Agricultural Trade on March 6-7, 2014 in Richmond, VA.